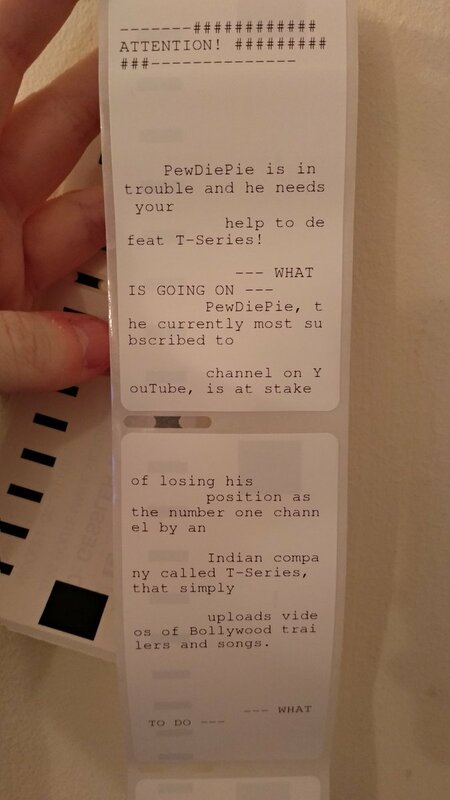 Printer hackers side with PewDiePie! In the latest of a series of attacks, printers across the globe have been forced to print posters urging victims to subscribe to the famous YouTube star Felix Kjellberg, more commonly known as 'PewDiePie'. Hackers have claimed to have taken control of around 50,000 printers in the past month, causing affected devices to print several pages asking those affected to unsubscribe from the quickly growing channel 'T-Series'. The hackers responsible for this attack have told the BBC that the goal behind the attack is the raise awareness on how serious hacking can be. "I've been trying to show that 'hacking' isn't a game or toy, it can have serious real-life consequences," one of the hackers told the BBC. As well as the hackers intending the goal behind this attack to be to raise awareness, one of the hackers under the handle 'TheHackerGiraffe' shared his thought process around this attack on Twitter, going as far as to explain exactly how he took advantage of a vulnerability in around 800,000 printers across the world. This hacker showed us how serious these vulnerabilities could be when saying that these vulnerabilities could have the "ability to access files, damage the printer, access the internal network." The hackers went on to defend themselves by, "I had to do this, to at least help organizations and people that can protect themselves..." over Twitter. If you're worried about these sorts of attacks then do not be! You can keep yourself safe by simply keeping your printer software up-to-date, all windows updates are installed and ensuring your network security is updated and correct. Have you been affected? Let us know below!